We know that a great tasting chocolate bar requires great tasting cacao beans, and therefore we’re committed to sourcing the highest quality — directly from farmers. Our beans come from Malaysia, we know exactly where they grow and who they’ve been grown by. Every estate has unique flavour profiles; it changes depending on the climate, soil, topography, harvest, fermentation and drying methods. After fermenting the beans, they need to be dried to stop them from fermenting any further. Drying is done outside on large surfaces that is exposed to all sorts of things; our very first job is to sort through the beans and find anything unwanted from twigs to rope. We also discard small, odd shaped and defective beans as these make it difficult to crack and winnow later on in the process. We roast in micro-batches; two kilograms at a time. As a young company it’s affordable for us in a standard-sized rotisserie oven, and also allows us to control and evenly roast every batch. For each and every estate, we go through different roasting profiles to find the best flavour and aroma. We guarantee that if you tried the beans with different roasting profiles, it changes so much that sometimes it can be quite difficult to choose which profile to run with. As the beans slowly rotate, the nibs lose moisture, which creates steam and loosens themselves from the husks. Once the roasted beans have cooled down, the husks loosen off the nibs. To separate the husks and nibs, we pass our beans through “The Crankandstein” — it has three steel rolls. The beans get cracked, then channels down to the big sieves underneath. This allows us to organise the pieces by four different sizes, which makes it efficient for winnowing. A little bit of wind. As husks are lighter than nibs, we use the power of the wind and gravity together. 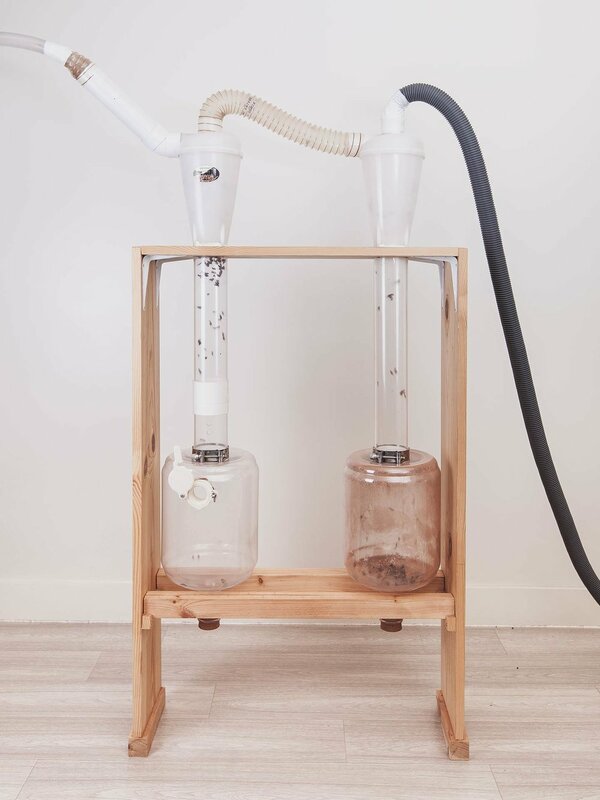 We turn on the hoover that’s connected to the winnower — Nibs fall down the first tube, and husks down the second tube. Our production is micro-scale; the amount of nibs is quite tough for our two litre stone grinder. We need to mill the nibs into a paste before refining them in the next steps. For smooth, rich and unctuous chocolate; we need to grind the nib paste smaller than what your tongue can feel, which is 30 (0.03mm) microns. The grinding machine, also known as the wet grinder or melangeur; consists of two wheels spinning on top of a stone base. 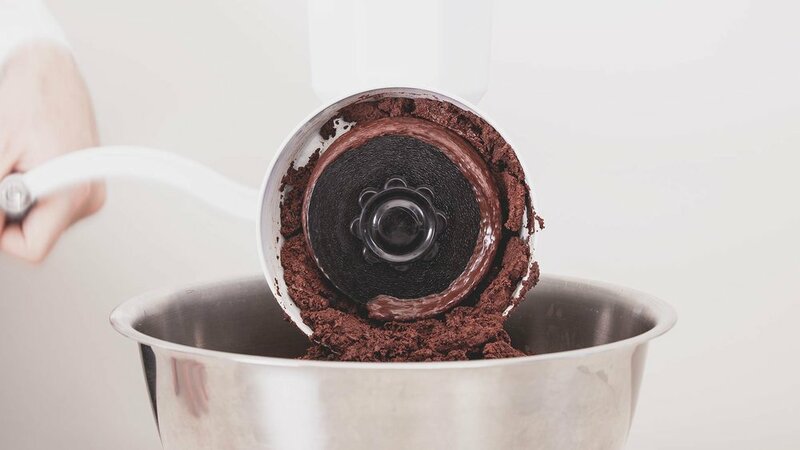 Wheels spin and the particle sizes reduce; friction heats the cocoa butter and turns into cocoa liquor. After 12 hours of grinding; the liquor becomes fluid. At this point we add two ingredients; sugar and a little bit of cocoa butter, which helps get the texture we want. Conching; the fine tuning of the chocolate process, the last step where we can alter the flavour and the viscosity of the chocolate. We simply release the pressure of the stone wheels to create heat and movement. The chocolate is aerated and removes unwanted volatile components; acidity and astringency. We have to be careful at this stage that we don’t conch too much, as this can reduce those fine flavours from Malaysia. If it isn't shiny, it isn't worth it. Sharp snap. Beautiful shine. This is why tempering is important. If chocolate isn’t tempered properly; it will look dull, sugar will bloom on the surface and crumble when you snap. Tempering chocolate is playing with temperatures; firstly, we melt the chocolate high enough to melt the different types of cocoa butter crystals. This cools to form the wanted cocoa butter crystals, which makes the bar shiny and give it a great sounding, sharp snap. Afterwards, we raise the temperature to help those crystals to spread evenly through the chocolate. Our signature chocolate bar transforms the tradition of chocolate into a modern, sensory experience. We’ve researched and tested different designs, shapes and thicknesses to give you a ‘Beau’ trip of chocolate. It’s shareable, fun to break, and at the same time it has an unusual shape that fits into your mouth that evenly melts and tingles your taste buds. Presentation is hugely important to us. The bars are specially moulded, with each piece having a sculpted shape that sits comfortably on the palate. At the centre of each bar is a cacao pod-inscribed tablet, a little branded ‘prize’ to work towards.